I want to create a minimum order dollar value before checkout is possible. How can this be done? this what i have at the moment is this right? hi is this correct ? HI I did that but it is not working . 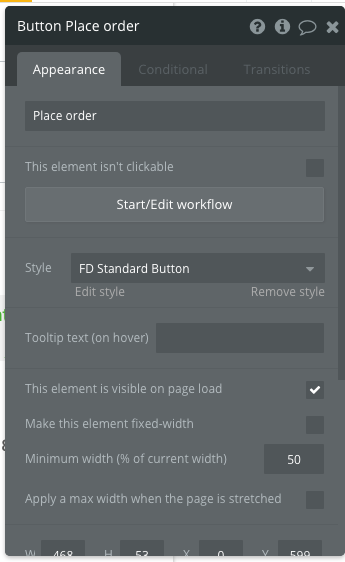 Now the element is not clickable at all. Regardless if the cart price is over the minimum amount which is $300. 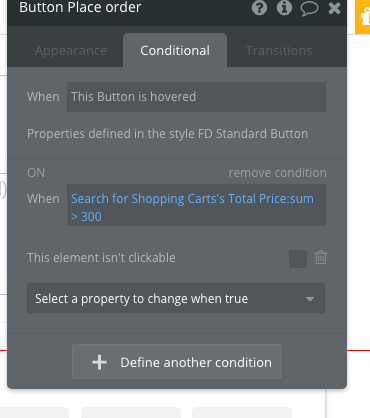 Try: Appearance: This button is not clickable “uncheck”, Conditional: Search for shopping carts total price: sum < 300, this element is not clickable: check. Also, you can use debug mode and inspect your button place order to see if everything is applied correctly. I tried and this is still not working. Any more suggestions? Can you soe Appearance too? And did you check in debug mode? how do i set the app to public . And what link do i Give to You? I dont understand the part about the link. Food Depot - delivers groceries from local stores you already shop at. Choose from stores like Tru Valu, Price Smart & More. Try us today for free. You are in the wright way. Are tou sure your search:sum is adding up to correct result? If not, temporarilly add a text element to your page to show the result of that. Make sure that the “this element isn’t clickable” in the button’s general settings IS checked. 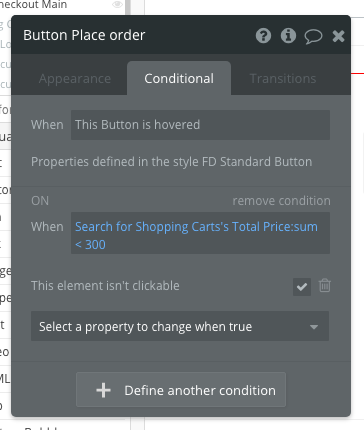 Than, in your conditionals, you need the “search:sum > 300” and have the option “this element isn’t clickable” UNCHECKED. This should be prety straight forward. The sum returned by this page (https://fooddepottt.com/version-test/checkout?debug_mode=true) is 11936.67 even if my cart is…89.87 including shipping fee! I see a few design issue too. You are using a lot of search, but you should reduce this to your repeating group I believe and work around your repeating group instead of doing the search again for subtotal, service charge and so on.